Max Protetch Gallery is pleased to announce its first exhibition in its main space of the work of Siebren Versteeg. Zero Is The Center includes interactive paintings, digital prints, and sculptures that dissect the interactions media, intention, and indeterminacy. In many of the works, extensive use is made of the internet as a generative source of information and imagery. By developing precise algorithms that guide the flow of information, Versteeg models the movement and content of the ambient digital atmosphere into artworks that balance choice and chance. Versteeg�s current work can be seen through the lens of mid-twentieth century artistic developments advanced in the work of artists like Robert Rauschenberg, Jasper Johns, and John Cage. Some of the pieces on view even borrow their formal language from specific artworks from this period. New York Windows is a diptych of interactive �paintings�. On the screen at any given time is an image compiled from a combination of internet sources and digital additions programmed by the artist. However, the image is larger than the frame seen on the screen, and the areas of it that are beyond the frame are constantly being updated and revised with new information culled from the internet; by dragging the image much like one might drag an image on Google maps, the viewer can bring these newly formulated sections into view. Simultaneously, other areas are being redrawn. The artist�s programming �hand� is present as a persistent ghostly presence working just outside of what is visible. Another real-time video �painting�, Flag, takes the canonical Johns Flag paintings as a jumping-off point. 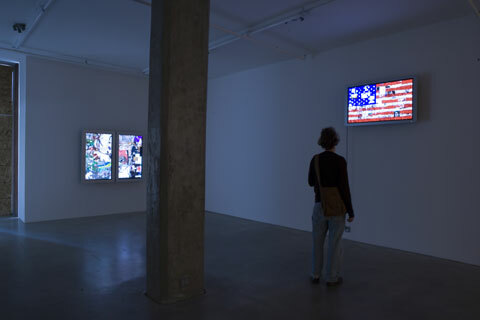 Just as Johns incorporated collaged newspapers into his painted objectification of the American flag, Versteeg programs a composite image made up of many images drawn from the internet. While the form of the flag is held constant, the materials (digital images) that compose the flag are constantly changing. A similar approach has been utilized to create Self-Portrait. A flat panel monitor has been balanced on an artist�s easel; on the screen is an image of the artist created from digital brushstrokes that continuously re-paint themselves. The artist�s hand has been re-contextualized, rewritten in a gesture that is at once ironic, melancholic, and comic. A single channel video, Mortar and Pestle, begins as a single monochromatic field that fills the whole screen. Accompanied by crushing sounds, the image breaks down exponentially into smaller and smaller pixels. But as the pixels get smaller, an image comes into view: the artist using a mortar and pestle, destroying one thing to create another, a process whose analogue can be found in the manipulation of the image itself. After the image has �devolved� into a perfectly clear picture, it begins to replicate itself, filling the screen with smaller and smaller images, until once again a monochromatic field prevails. A similar concern with atomization can be found in two inkjet prints that mimic sheets of particle board. On closer inspection, the particles are seen to be precisely organized, oriented around a perspectival point at the center. It is also present in Grand Canyon, a lightbox that, when viewed from a distance, seems to show a panoramic view. In fact the iconic American panorama is made up of thousands of red, green, and blue abstracted high-rise buildings, conflating the built and natural environments. For a series of eight-by-eight-foot algorithmic drawings on canvas, Versteeg collaborated with J. Patrick Walsh III, who created custom, hand-painted frames. The drawings, which resemble networks of highways, wires, or veins are like intricate mandalas. Their sheer complexity suggests the presence of a super-human author, but their juxtaposition with decidedly handmade frames makes their presence as physical objects intensely felt. Negative Shadow Of A Fake Fire is a sculpture that shows how layers of mediation work on visual understanding. A waving flame lamp sits atop a wooden crate, flanked on one side by a bright light and on the other by a scrim. A video camera is trained on the scrim, capturing the silhouette (black on white) of the fake flame, and transmitting it to a projector. On the wall near the sculpture an image of the flame is projected, but with its values reversed, white on black. There is no real fire, but the object dramatizes the visualization of energy. With implied references to cinema, surveillance, and scientific experimentation, the work suggests that, while perhaps there is no central or originary phenomenon to observe, an endless loop of representations provides a productive system for humor, play, and communication.